I don't know if it's a nature of being human or particularly being a girl or it's just me but a compliment sure can change my mood to be happy all day and it made me feel on cloud nine every time I recalled about it...with a silly smile plastered on my face, making everyone around me wondered "gila ke apa dia ni?". There, that's the effect of a compliment on me. The one thing I'm good at, and being complimented on, is my sketching skill. Knowing that I'm the only one in the family who can draw, I always post my drawings in the family WhatsApp group, wanting a compliment from my family members. My typical younger brothers, of course, wouldn't compliment me but my parents would, so it's enough to make my day. I first get inspired to draw was when I get drawings update from my seniors, Syahmi and Mey Kamal, in their Instagram (click their names to go to their Instagram). They both started as an architecture student, eventually improved their sketching skill by practicing and now both of them are well known among people who loves art. Yes people, practice does make perfect, I've proved it. My sketching skill wasn't good from the beginning. 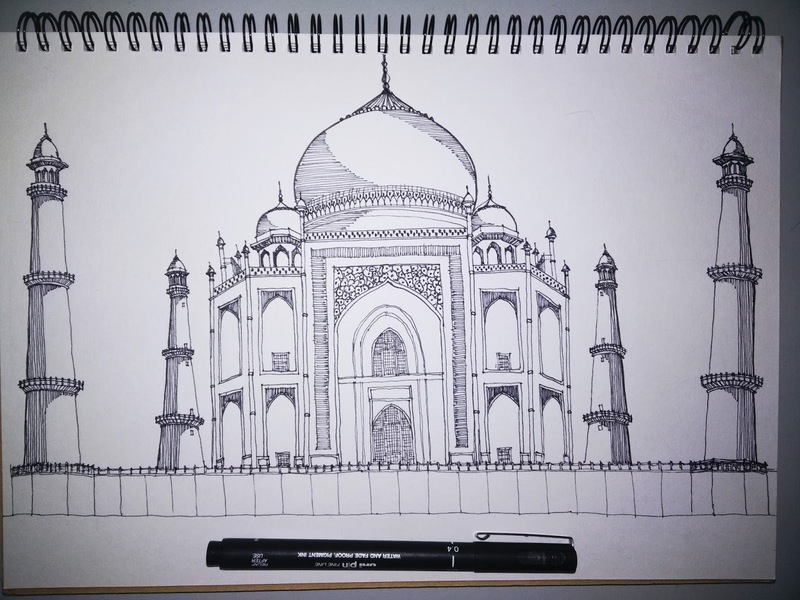 In the early year of studying architecture, I was always down for not able to draw while people around me could produce a realistic drawing. But I never gave up, and keep practicing until I now can proudly say that I can draw. So I came up with an idea to make a sketch post at least once a month (because I rarely sketch these days). Here is my first, for December, a sketch of Taj Mahal, India. This one is my latest, proudest sketch. Hope you like it, AND COMPLIMENT ME, PLEASEE teehee. Damn, this is just so amazing. I could say more because this is totally great! oh my god cantik! art is my major weaknesses, nak buat straight line pun tak reti so whoever yang do art so well always impressed me hehe great job! believe me, the early years mmg ada belaja buat straight line and I wasn't good at it at that time. haha. Thank you ! Nothing much to say. You do have a great talent in drawing . And , it's human nature dear . We do need a conpliment in every thing we do . Agree with u compliment can change our mood . Sometimes compliment give us to moving forward . Makes is do something more eagerly.